Completed in 1849, this hall was built by the Stambaughs for their carriage works. 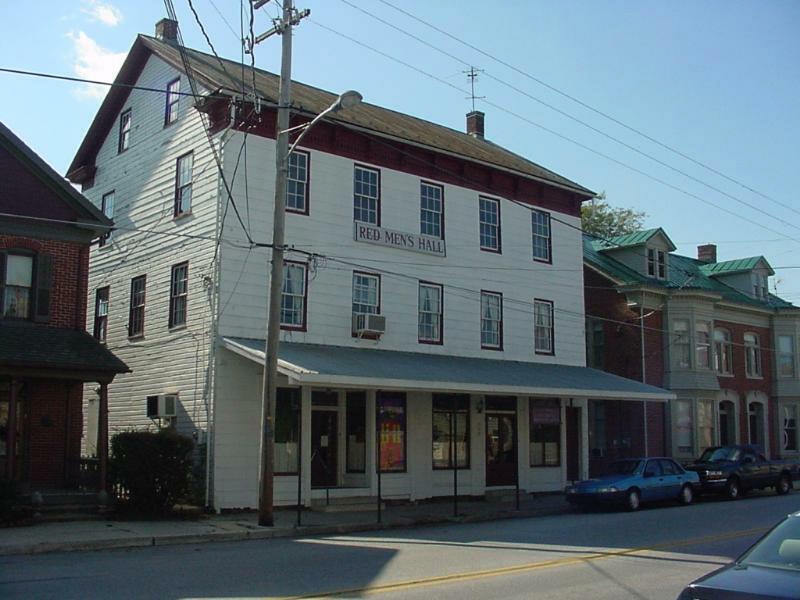 After 1888, when the business deteriorated, the Order of Red Men purchased the building to house their Oniska Tribe #40. Over many years, the building has been used for numerous traveling shows and as a school house. In 1907 it was a butcher and bake shop. Prior to 1925 the building housed a cigar factory. During the 1940's, Wolf Bros. ran a pool hall in the building. Glenn Cashman conducted his hardware business here from 1946-1951. John Grover originated his Home Service Store in this building. In more recent years it was used as a place of worship and a craft supply business. The building, purchased in 1990 by the East Berlin Historical Preservation Society, currently serves as the Society headquarters. Much work has been done on the building: a kitchen was created, a new furnace installed, and a museum and library were opened on the second floor. Monthly administrative meetings and general meetings for membership are held here. The building is also host to our Education Program which gives school students a tour of three of our five buildings.